Product Code: 87217186 Manufacturer Code: 193212. 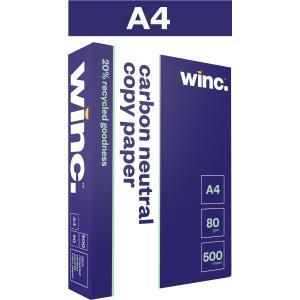 Winc Carbon Neutral 20% recycled Copy Paper is an Australian Made paper that offers both quality and value. Due to its high whiteness and smooth texture this product will produce professional standard documents and is perfect for high speed copying, colour printing, double sided printing and both text and graphics. Ideal for use in copiers, laser printers, inkjet printers and fax machines. Winc carbon neutral 20% recycled is produced from 80% Elemental Chlorine Free (ECF) pulp along with 20% Post-Consumer waste (PCW) recycled pulp and is Acid Free with archival properties of 200+ years. A4 & A3 are PEFC® certified and are Carbon Neutral from cradle to grave.